We study cyclic polling models with exhaustive service at each queue under a variety of non-FCFS (first-come-first-served) local service orders, namely last-come-first-served with and without preemption, random-order-of-service, processor sharing, the multi-class priority scheduling with and without preemption, shortest-job-first, and the shortest remaining processing time policy. For each of these policies, we first express the waiting-time distributions in terms of intervisit-time distributions. Next, we use these expressions to derive the asymptotic waiting-time distributions under heavy-traffic assumptions, i.e. when the system tends to saturate. The results show that in all cases the asymptotic waiting-time distribution at queue i is fully characterized and of the form Γ Θi, with Γ and Θi independent, and where Γ is gamma distributed with known parameters (and the same for all scheduling policies). We derive the distribution of the random variable Θi which explicitly expresses the impact of the local service order on the asymptotic waiting-time distribution. The results provide new fundamental insight into the impact of the local scheduling policy on the performance of a general class of polling models. The asymptotic results suggest simple closed-form approximations for the complete waiting-time distributions for stable systems with arbitrary load values. Vis, P, Bekker, R, & van der Mei, R.D. (2015). 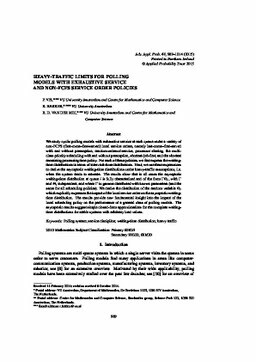 Heavy-traffic limits for polling models with exhaustive service and non-FCFS service orders. Advances in Applied Probability, 47(4), 989–1014.